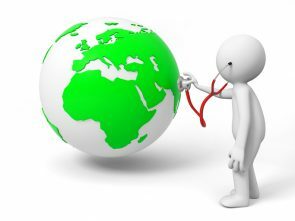 You are here: Home / Aktuelt / Health & Wellness / Stroke – every minute counts! The commonest cause of these diseases affecting the blood vessels is hardening of the arteries, or arteriosclerosis to give it its Latin name. 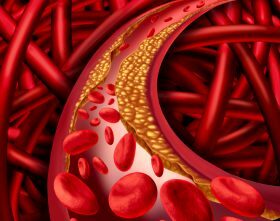 Hardening of the arteries damages the inside of the blood vessels, with fatty deposits restricting blood flow. Risk factors for this include old age, smoking, high blood pressure, diabetes and high cholesterol. This picture shows the fatty deposits in yellow. These are on the inside of the blood vessels. Stroke is a generic term for diseases that lead to a permanent disturbance in the blood supply to a part of the brain. In the vast majority of cases, around 85-90%, this is caused by a blood clot, while a less common cause is a cerebral bleed. 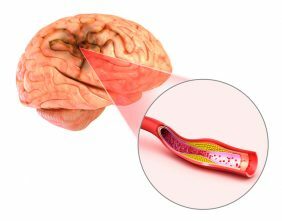 The blood clots may either be formed locally in the brain (thrombus) or as a result of a clot travelling from either the heart or the blood vessels in the neck to the brain (embolus). The dark area shows the part of the brain that has lost blood supply. Face: Try to smile. If your mouth is lopsided or one corner of the mouth is hanging down, you may be having a stroke. Arms: Try to stretch out both arms and then turn the palms upwards. If one of your arms drops, is jerky or uncoordinated, it may be a sign of a stroke. Paralysis, numbness and loss of strength in one side of the body are common symptoms of a stroke. Speech: Has there been a change in your ability to speak? If your speech is slurred or you’re having difficulty finding the right words, this may indicate a stroke. Time: If you think you may be having a stroke, you need to get to hospital as quickly as possible. Ring for an ambulance. Rapid treatment and, where appropriate, rapid rehabilitation are vital in strokes. Some people make a full recovery but for others the damage to the brain will cause permanent problems. However, it is possible to recover your physical capacity, in full or to some degree. And although stroke is commonest in people over 70, it can affect people of all ages. That’s why it’s always better to seek medical attention and be on the safe side.